Alps Electrical - Electrician based in Kirklevington, Cleveland. We are a local electrical contracting business with over 25 years’ experience serving Teesside and the surrounding areas. From a 16-year-old apprentice the owner of ALPS Electrical has gained vast experience in mostly all sectors of the electrical industry, including Domestic, Commercial & Industrial. 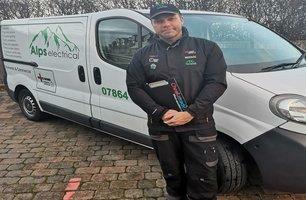 Andy has gained many accreditations over the years even earning himself 'apprentice of the year award' (many moons ago), and so you can be sure that your job is in very capable hands. Now specialising in all aspects of domestic electrical services, we pride ourselves on our reliable, efficient, and trustworthy work ethic. We treat your property as if it were our own and always work safely, leaving the area clean and tidy to minimise disruption to our customers. All our electricians are time-served & fully qualified to the most current industry regulations, which include the 18th Edition (BS7671) wiring regulations, Part P, City & Guilds 236 Parts 1 & 2, AM1/AM2, NVQ Level 3 and are approved domestic installers by NICEIC. We proudly offer an absolute no quibble 100% satisfaction guarantee on your work. If for any reason you are unhappy we will remain on your job until you are. We want you to be satisfied with the work we carry out, and promise to ensure that our high standards are always met. We also offer a 12-month warranty on all of our labour and parts. Call us today for a fast & free no obligation quotation on your work. All work is fully guaranteed for 12 months and covered by our 100% satisfaction guarantee promise! Reliable, efficient, trustworthy, fully qualified local NlCEIC approved electrician who will treat your home as his own. With over 25 years experience we offer a 100% satisfaction guarantee!